Djembe for sale, Dunun for Sale, Kamele n'goni for sale, Djembe skins. 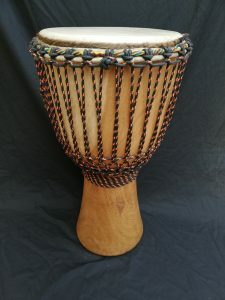 We hand pick our djembe drums from some of the best and most experienced carvers in West Africa. The drums come in fully prepared or as shells which are skinned and roped by professional drum makers here in Ireland. We will help you find the best drum to suit your level and experience. Your always welcome in for a test drive. We stock drums from Guinea, Mali, Ivory Coast, Burkina Faso and Ghana. 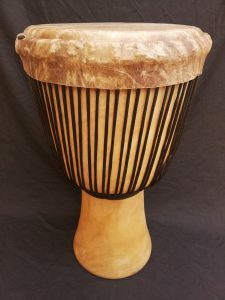 A well balanced full sized djembe made of golden hardwood from Guinea, West Africa expertly skinned and ready to play. A well balanced full sized djembe made of Iroko hardwood from Ghana, West Africa expertly skinned and ready to play. Iroko djembe have a warm sound and are relatively light weight.